The Gospel of John, with a cover perfectly suited for military use. Printed in a matte finish (most of our Gospel covers have a shiny finish) so that it doesn't risk creating a reflection in sunlight. Features modern graphic design throughout with oversized chapter numbers to enhance readability. There is no text on the front cover. Logos on the back cover and response flap are reproduced in black rather than our normal red color, because we didn't want to risk using a bright color that might put a soldier in harm's way. 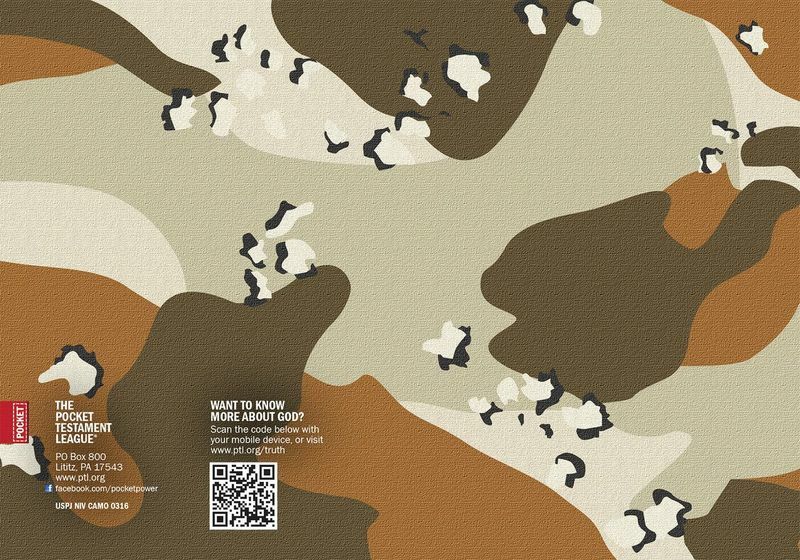 A wrap-around cover in authentic desert camo pattern. Shown are the front and back cover spread. If you'd like a deeper understanding of who Jesus is and what it means to put your faith in Him, we've put together a powerful, free 4-part correspondence course.